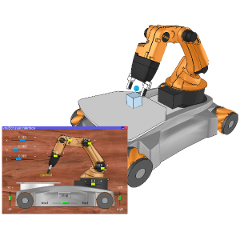 Simulator and simulations are fully customizable, with 6 programming approaches that are mutually compatible and that can even work hand-in-hand. 6 fully supported programming languages. 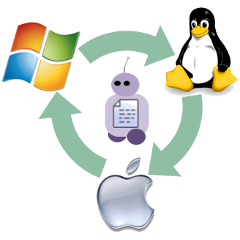 ROS & BlueZero interfaces: publishers, subscribers & service calls. Support all standard messages, extendable. 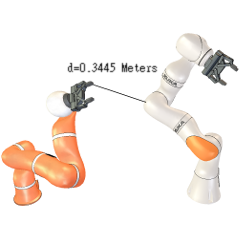 Inverse/forward kinematics calculations for any type of mechanism (branched, closed, redundant, containing nested loops, etc.). An embeddable version of the IK/FK algorithms is available (i.e. can run on your robot). V-REP supports customizable particles that can be used to simulate air or water jets, jet engines, propellers, etc. 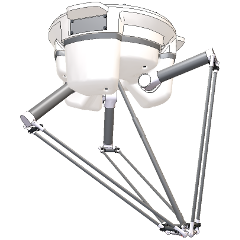 Fast interference checking between any mesh, octree, point cloud, or collection of those. 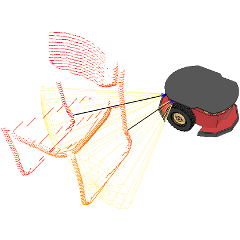 Fast and exact minimum distance calculation between any mesh (convex, concave, open, closed), octree, point cloud, or collection of those. 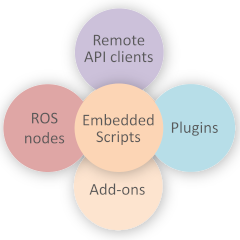 V-REP is cross-platform, and allows the creation of portable, scalable and easy maintainable content: a single portable file can contain a fully functional model (or scene), including control code. 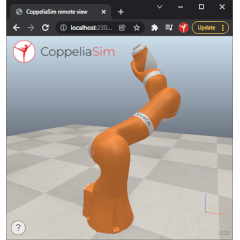 Anything - from sensors or actuators, to whole robotic systems - can be built within V-REP by combining basic objects and linking various functionality via embedded scripts. Every scene object can have its own embedded script! 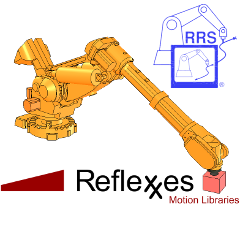 The RRS-1 interface specifications are fully implemented, and the Reflexxes Motion Library type II is fully supported. 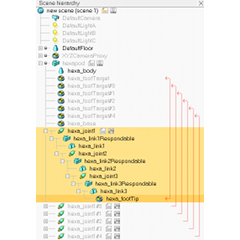 The scene composition is intuitively visualized in a scene hierarchy view, indicating object names, types, associated control scripts, loop closures, selection and visibility states, warnings, etc. Free Educational License Free Player Version Many More features! e.g. 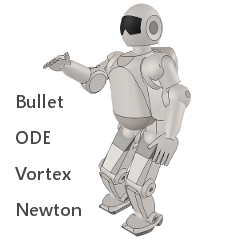 multilevel undo/redo, integrated ray-tracer, movie recorder, simulation of wireless communications, simulation of paint or welding seams, octrees, point clouds, exhaustive documentation, etc. Various types of joints (revolute-, prismatic-, screw- or spherical-type). 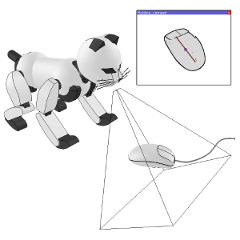 Path or trajectory functionality for elaborate kinematic movements. 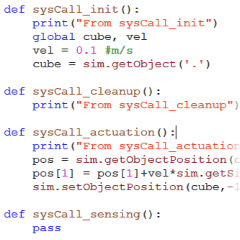 Distributed control and script-driven: each scene object can have an embedded script attached, all operating at the same time, in a threaded or non-threaded fashion. Minimal or no programming required for simple simulations. Fully customizable main client application loop. Unlimited number of simultaneously opened scenes. 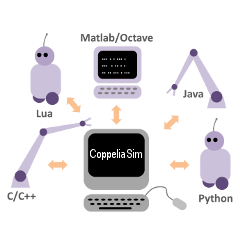 Full copy/paste functionality, not just for objects, but also for their associated behavior (programs), also during simulation. 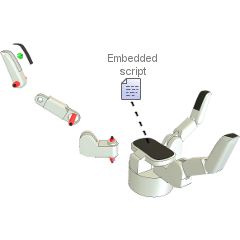 Model self-duplication or self-destruction capability (from within the model itself), together with associated calculation objects and embedded scripts. 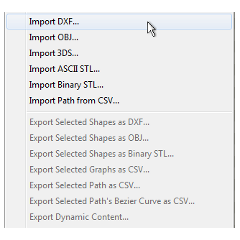 Convex decomposition and convex hull calculation functions. Powerful and flexible wireless communication simulation and visualization. Very elaborate and easily extendable means of communication within V-REP or with the outside world. 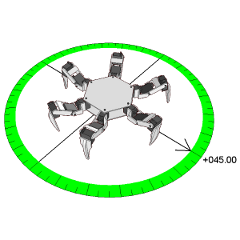 Customizable drawing objects (points, lines, triangles, etc.). 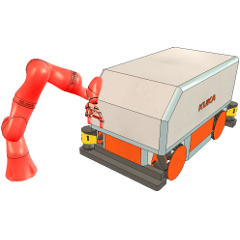 Allows simulation of paint, welding seams, etc. 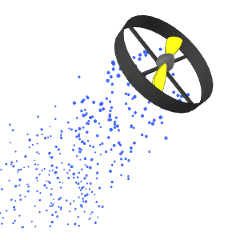 Customizable dynamic particles. 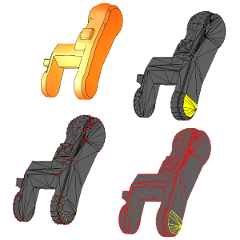 Allows simulation of air or water jets, jet engines, propellers, etc. 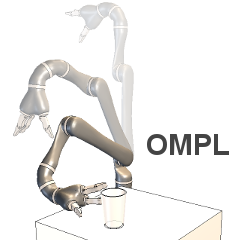 Objects and attached functionalities are fully scalable (resizable), also during simulation. 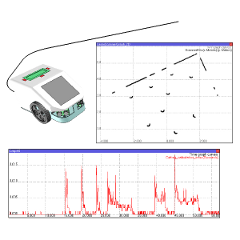 Simulation speed control also during simulation. 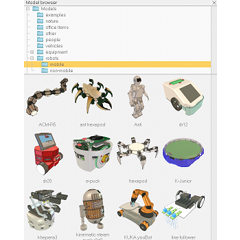 Compact scene and model files (one single compressed binary file containing all what is needed (objects and programs)). Possibility to lock scenes from further edition/modification, script content viewing or resource export.